Teaching Letter-Sound Connections to a Child with Special Needs - GABRIELLA VOLPE, B.Ed.GABRIELLA VOLPE, B.Ed. The English language is a complex language. If you are teaching a child with a language learning disability (whether or not accompanied by other disabilities) to read or write, the task is a great one. You might be wondering if you should tackle the alphabet before your child is uttering sounds. Should you teach him to read? Should you bother with writing? The answer to each of these questions is: yes. Just because your child cannot speak or read aloud, does not mean he or she cannot learn to read and write. Although reading and writing skills are affected by a language delay, with the right support, a child can indeed learn to read and/or write. Some parents and teachers choose to teach reading to a child with special needs from whole to part (from words to their individual letter sounds). Others focus on phonics right from the start. This post assumes that you have already decided whether you will take a whole-word or phonetic approach to reading and writing, and your child is ready for learning letter-sound connections. Alpha Awesomeness and Spectacular Sounds by Molly Lynch is a collection of phonetic posters that not only introduces children to letters and sounds, but also provides opportunities for hands-on practice. In this post, I will show you how to use this kit with a child with a speech/ language delay or disorder. For details on the full package, see the product description. Below are 6 suggestions for using this phonics unit with a child with a speech/language delay or disorder. 1. Begin with letters associated with speech and articulation development.Speak with your child’s speech-language pathologist about the order of sounds generally acquired by children and which one(s) your child is showing readiness for producing. 2. Teach capital letters first. When printing and laminating the cards, blot out the lowercase letter in the letter formation set so that you only display the uppercase letter. While the order of teaching lower- versus uppercase letters is debatable, for the child with special needs, learning uppercase letters first is generally easier. Uppercase letters are mostly straight lines and all letters begin at the same top line when handwriting. Introduce the partner letter when your child is showing readiness. 3. Relate to real objects. Use toys and objects found around your home that begin with the letters to make meaningful letter-sound connections. 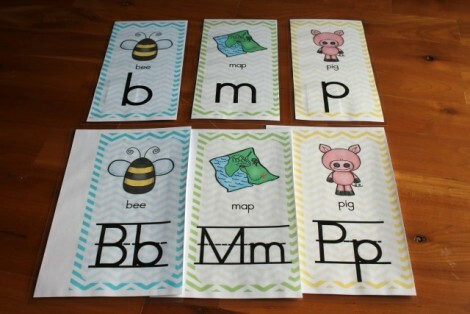 Have your child practice by tracing the letters on the posters with a finger. If your child can hold a marker, use a dry-erase marker directly on the posters. 5. Create a sound pouch. Laminate two posters back-to-back and cut along one edge to create a pouch. Have your child locate objects that begin with that sound, and insert it into the pouch as you emphasize the letter sound. Stick two or three letter posters on a wall. From across the room, ask your child to run and touch the letter symbol for the sound you articulate. For example, say, “Touch /p/” rather than naming the letter ‘P’. To build literacy prerequisites, see the parental tips offered by the American Speech-Language-Hearing Association. This post originally appeared on Educents’ blog.